So many good things have been happening these past couple of weeks! Must be the rush of the holidays that are now upon us. 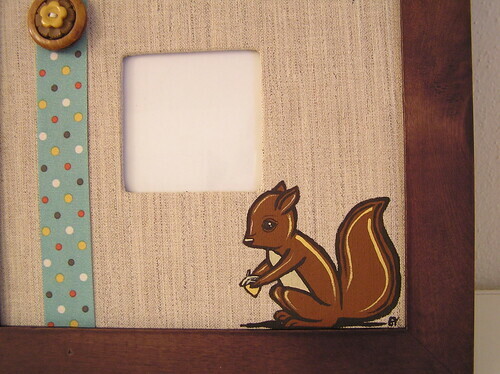 I’m working on creating more of these squirrel frames for upcoming holiday shows. This one I made for Sarah (hiptopiecesqaures) as a thank you gift for being my maid of honor at my wedding. Luckily, i have three more frames to make. Upcoming craft shows means I have to go out hunting at antique and thrift stores for some supplies. Anyone who thrift shows knows what a thrill it is to find something you are looking for. 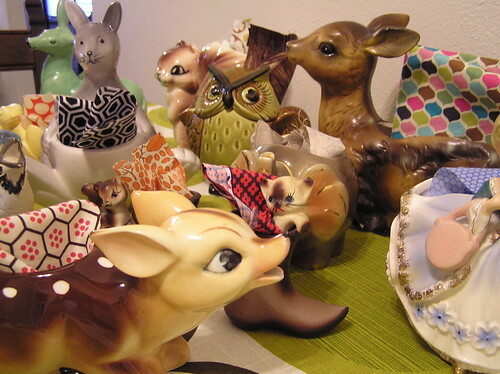 The planters I use for my pincushions are my favorite things to look for, and I especially get excited when I find deer and squirrels! My last trip to Ohio proved to be a good one for planters. Another fun part of this craft is picking out coordinating fabric for the planter to make the pincushion, and in turn the pins that go with them. My kitchen table quickly became an assembly line full of thread, fabric and stuffing! I’m so pleased at how this little deer turned out! Isn’t she adorable? 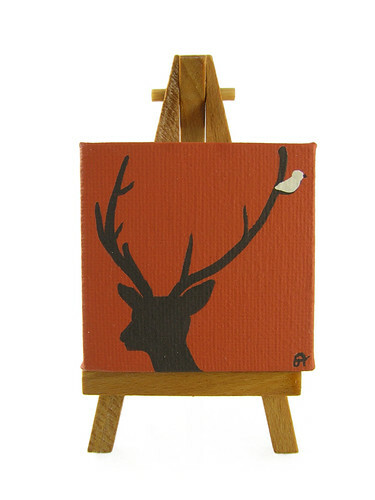 Just Resting mini painting and stand, too cute! New Design! 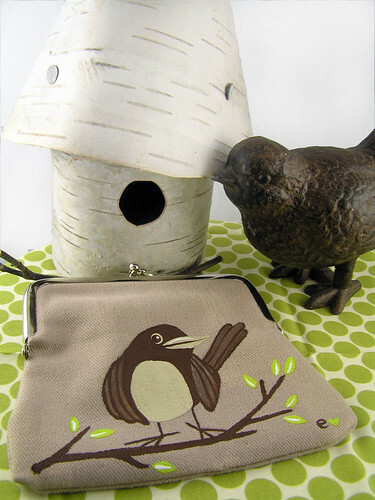 Tweetie coin purse. So excited to do more with this design! What do you think? 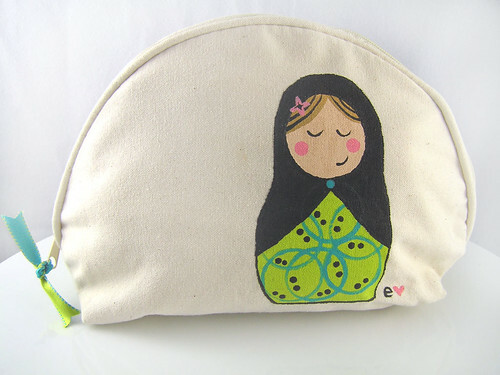 Babushka makeup bag, perfect for those holiday travel essentials. 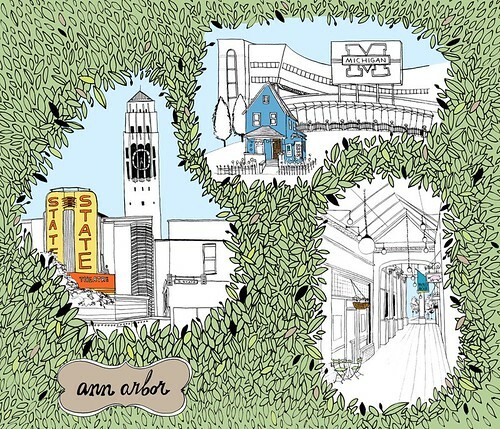 I also helped out my dear friend Sarah of hiptopiecesqaures make a new sign for her booth for Art in the Park in Ypsilanti, which happened last Saturday. We worked out of Sarah’s studio, and amid a lot of laughter, we did manage to actually get some work done! 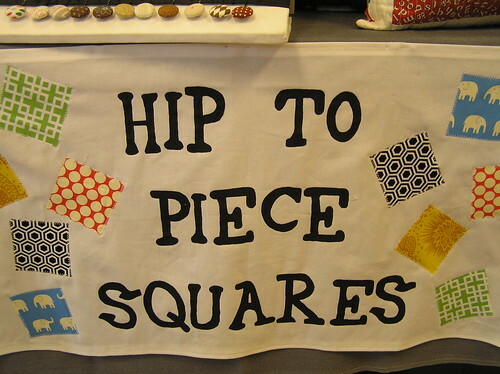 Sarah sewed the squares and I painted the words. We joked that we have been meaning to do a collaborative piece for awhile, and well, here’s the first of many I’m sure. I think it turned out great. At Art in the Park, I picked up some lovely new art pieces for my apartment. 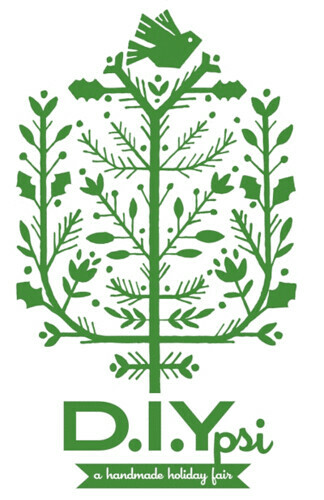 Mark your calendars for DIYpsi holiday craft market- I have said this a couple times, but I’m serious people…this show has the MVP’s of the local craft scene as vendors and a not miss opportunity to get your holiday shopping done. Check out the amazing vendor lineup on their website– I haven’t been this excited to be part of a show in a long time! Check out my Etsy shop, newly updated with items you’ve just read about! 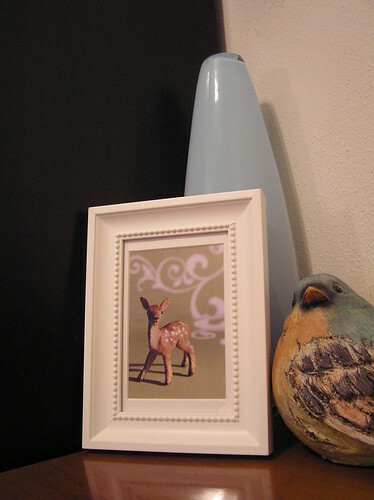 You are one speedy framer — can’t believe you already have the print up on the wall! Most impressive. Thanks so much for the shout-out! 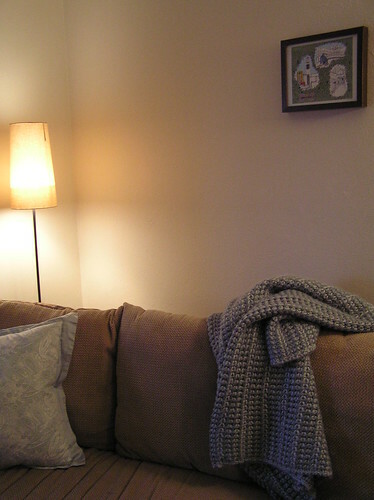 And I love that knitted throw on the couch — gorgeous! What great stuff! I do like the Tweetie coin purse. Great design. 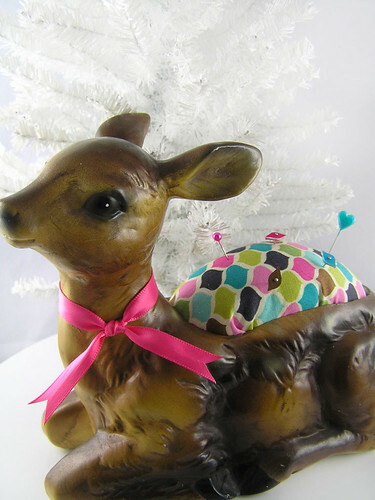 The pin cushion idea is INGENIOUS! My hat goes off to you. Great stuff.